Dolpa offers a wonderful chance to experience a landscape and culture far different from seen in other parts of country . it is located in the central west of the country. The focal point of the area is Shey Phokundo National park. This remote and rugged protected area is both scenically and culturally attractive. It is the habitat of various rare and endangered plant and wildlife species many of which can be seen nowhere else in the country. Animal species of particular interest in the national park are populations of snow leopard, grey wolf and blue sheep. The most obvious group of people seen in the northern parts of the area. Particularly in Dopa, are of Tibetan origin. Similar to Tibetans and Sherpas they rely on eking out a living on the high pastures and supplementing this with trade both to the north and the south. For years, their salt caravans have been a common site along the mountain passes. Their religion is a mixture of Tibetan Bhddhisum and the ancient, pre Buddhist , Bon religion, a largely animistic faith. Strangely, their language is based on the Tibetan dialect spoken in Kham, a province of old Tibet located many hundreds of kilometers to the east. Starting from: Kathmandu Beni by bus. Day 03 By bus to Beni Bazar. Drive will take approximately 9hours. Follow the river(Myagdi Khola), which starts from the Dhaulagiri glacier. There is a hot spring along the way. Cross the bridge of Myagdi Khola. Climb up a rocky path dug into the cliff just over the river. Trail ascents and descends through village and forest. In good weather possible to see Dhaulagiri massif with its 6peaks, the Putha Hiunchuli and the Churen Himal. From here the path is flat through the villages of Takum and Sibang. After Sibang start the climb to the small village of Mattim. After reaching a crest go down to Mura. 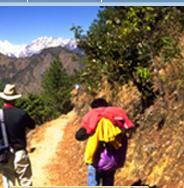 Trail continues through forest and villages towards to Jaljale. From the top of the Jaljale will take about 4 hours to reach Dhorpatan valley. Mean the time walking through an incredible forest of pine trees, junipers, flowers and small hills. Several times you will have to cross the river. Cross the valley and climb up to reach the banks of Pagune khola. From here start a steep ascent following the river between rocks and canyons, up to the summit of Pagune lekh. Which is marked with a small Chorten( pile of stones adorned with prayer flags). Beautiful view of Dhaulagir, Chure and Putha Hiunchuli. Descent to a grassy meadow where there are some abandoned huts. Cross a small river than enter to a fantastic jungle. Follow the path of many small peaks with beautiful view of Ghustung Khola to reach to Pelma village. The path goes through grassy, dense forest leading to a narrow gorge and an unnamed river. Jumping from one rock to another to reach to Dhule. Climb up to a small passage . the path becomes flat then start long ascent to the Nautale La(3970m), which is marked with a Chorten. From here start the descent to the bed of Seng Khola. Where are many caves. It is very easy to see steep path leading up. 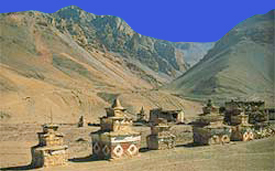 The pass is marked with a Chorten and a small lake. From here the path is flat and clearly visible. To cross the pass it will take long time but not so difficult. From the top of Jangla La starts the old kingdom of Tichrong the valley of Fragrant water. Tichurong was an independent kingdom whose capital was Tarakot or Taragaon or Dzong. Trail follows the bank of river, where the valley becomes large and green. After village of Khani gaon to Lahini it is easy to see musk deer jumping in the middle of juniper and pine forest. From here The trail becomes a narrow and walking through in landslide and avalanches area. This is the most difficult and dangerous part of the trek. The valley becomes a narrow, deep gorges and crossed by innumerable small bridges, make the river more and more impetuous. The path is dug into the rock but many parts are covered over by rockfalls. After visiting all the gompas and Chorten in Tarap valley. The trail ascents through grassy meadows with plenty of flowers and wild rabbits jumping from hole to hole to reach to base camp. On the top of pass , marked with Mani stones. It opens a beautiful view of the Tibetan mountain and upper Tarap valley. After crossing Numla Pass trail descends towards to Poyon khola. Where you can see Himalayan sheep, jumping from one rock to another with incredible agility. Bagla pass surrounded by big glaciers and blade shaped rock cliffs. From the pass there is a beautiful view of all Kanjiroba. Soon after crossing the pass of Bagla you will reach to Ringmo valley with a complete view of the huge waterfall. Passing through dense forest to reach to Phokosundo lake. The trail goes down hill through narrow gorge of Suli gad river. Where you will see a few houses of Tibetan and Gurungs surrounded by beautiful fields. Trail continues through villages and along the river to reach to Dunai. Dunai is the administrative capital and has only market in all the Dolpa district. It is a very easy and pleasant walk. You will be transferred to the airport for your final departure from Kathmandu. An experience guide (trained by Ministry of tourism), one porter for every 2 persons, their meal/accommodation/transportation/salary/insurance/equipments.